The last of the Oshawa-built Camaros, a red ZL1, rolled off the line on Friday. This comes after six years of production and more than 420,000 units sold. The loss of the popular vehicle spurred General Motors to cut its workforce at the plant by 1,000 workers. (Photo courtesy of Facebook). 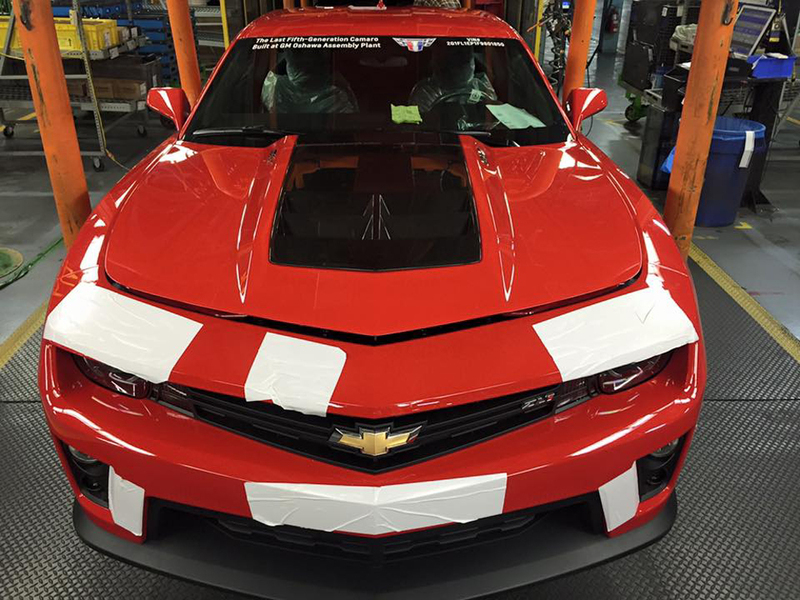 On Friday, a worker at the Oshawa Assembly was putting the final touches on the last Chevrolet Camaro to roll off the line. While the details of the last Oshawa-built Camaro are scarce at this point, what is known is that with the loss of the car’s production comes the loss of jobs. General Motors of Canada officially announced in June that the next-generation Camaro would not be produced in Oshawa, with production being shifted to Michigan. The Camaro wasn’t the only thing leaving Oshawa Assembly, with the automaker also announcing 1,000 jobs would be cut from the plant’s workforce through incentivized retirement offers. Svajlenko says that while the shift for Camaros isn’t going away with the end of production, it won’t be around much longer. Adria MacKenzie, General Motors of Canada’s corporate communications manager, tells The Oshawa Express that increased production of the Chevrolet Equinox has resulted in extra hours at the plant. The Camaro has been one of the hottest selling vehicles from the Oshawa Assembly, with more than 420,000 units sold between 2009 when it first entered production and 2014. Although production of the Camaro has ended at the Oshawa Assembly, Svajlenko says he remains enthusiastic for the plant’s future, especially now that union negotiations have concluded south of the border. United Auto Workers (UAW), the union representing many autoworkers across the United States, reached a tentative deal with General Motors late last month, coming only 16 minutes before the union was set to walk out on strike. The deal was ratified by union members on Friday. The new deal didn’t come without some hiccups, as it had originally been voted on by union members earlier in the month. While a majority of the union’s membership voted in favour of ratifying the agreement at the time, the majority of members working in the skilled trades initially rejected the deal.